Halloween is not one of my favorite holidays. I like the costume aspect, but the whole scary aspect plus greedy candy hoarding puts it low on my holiday list. With Hannah getting older, Brett and I had to decide if we even wanted to “do” Halloween, and if we did what it would look like. We tried to think of how we could make it as positive as possible and use the opportunity to encourage others. This may look different for use every year, but I wanted to share what we did this year (and cute pics of course). The day before Halloween, my friend Meghan and I decided to create “matching” costumes for Hannah and Cody. Many ideas were thrown around, but most involved trips to the craft store and too much time (in my opinion). We settled on Mary and Joseph. It might come across as us having our holidays confused or trying to over-Christianize Halloween, but really it was because Meghan was able to raid her fabric scrap stash and with a few swipes of the scissors and some yarn – voila, costumes! On Halloween, Meghan and I loaded the kids up (four total now, wow!) and went to a nursing home that said they were offering trick-or-treating in the afternoon. This sounded great because afternoon is much better than evening for preschoolers. We also thought this would be a good way to encourage others. Our time at the nursing home was brief because it was set up a little awkwardly, and some of the residents were a little confused and got mad when the kids asked for their candy. 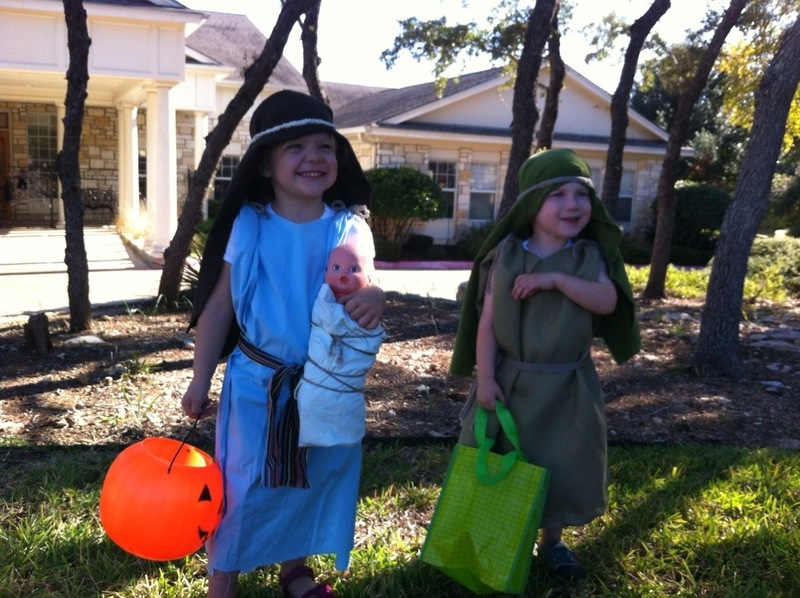 Another little girl had a meltdown because she wanted to take baby Jesus away from Hannah. But Cody and Hannah were very cute and came away very excited about their few little Tootsie Rolls. Whatever ended up in the classic plastic pumpkin was dubbed “trickertreats” which makes sense at this stage. Our street did not have a lot of lights on, so Brett took her to four houses and she came home happy with a very appropriate amount of candy. She was also happy that several kids came by our house before she went to bed and she was able to generously pass out our candy at the door. 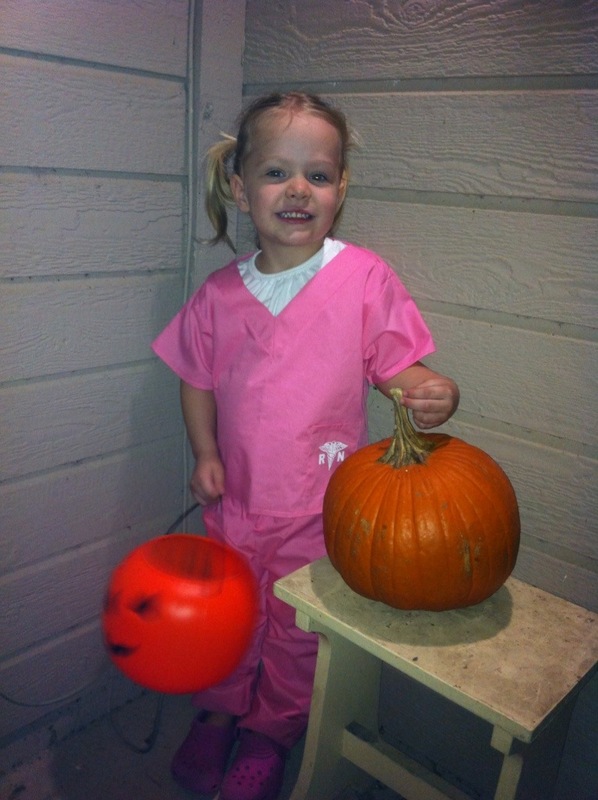 She even insisted that the parents take candy. Violet slept through the whole thing, but we woke her up to take some pictures with the good camera. I’ll try to post those soon. So that was our Halloween – the first one Hannah will really remember, and we hopefully we were able to fill it with fun, encouragement, sharing and, of course, trickertreats.